Hold up for a second. Did Michelle Obama just momentarily transform herself into a black woman poetry scholar on y'all? Yeah she did. I mean, people will say that she was simply providing a tribute at the Maya Angelou memorial. But I've been studying literary scholarship long enough to know when I see someone practicing poetry exegesis. In that one singular poem, Maya Angelou spoke to the essence of black women, but she also graced us with an anthem for all women, called for all of us to embrace our God-given beauty, and oh, how desperately black girls need that message. As a young woman, I needed that message. As a child, my first doll was a Malibu Barbie [audience laughs] that was the standard perfection. That was what the world told me to aspire to. Maya Angelou and her words lifted me right out of my own little head. How uncommon to hear such a prominent national and international figure like Michelle Obama talk about how a poem inspired her as a black girl and black woman. Public figures are often prompted to speak in generalities. But here Obama was speaking of herself as "black girl" and "black woman" needing and taking a "message" from a black woman poet. Obama was practicing a worldly mode of black poetry criticism. She was discussing how the poem made her feel and carry herself over the years. As usual, Howard, you are noting what genuine literary criticism is. Many thanks. Howard, Thank you for your keen ears and insight. Not in a million years will I ever forget the moment that you cite here in your post. 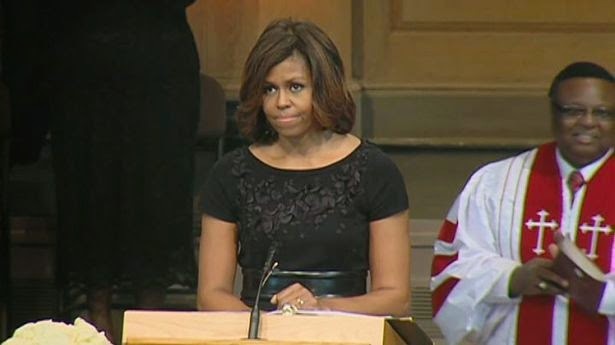 We had all filed in the chapel to remember Miss Maya -- in our own special way -- but the First Lady stood and offered something so intimate, so historical, so full of grace and courage, that after hearing her say what she said about Black girls and beauty it made me look to the right and to the left and to the front -- of me as I stood there-- at the face of every Black woman I could find in the room-- and there were so many of us there -- everywhere I looked so many brown cheeks were streaked with tears as the First Lady spoke -- what she was telling us was so personal and so powerful. She was speaking our story. She was honoring Miss Maya but she did so in such an intimate, generous, personal, and courageous way. The Black First Lady had of course been a Black girl once. Of course there is that part of the country that she is First Lady of, that always goes crazy mad when she goes there - to the shores of Blackness in order to tell her truth - the truth of what it means to be a Black woman. But that uninformed insecure part of the country was not in the chapel celebrating Maya Angelou… or if they were they didn't have the nerve to shout out "LIAR" as they have cowardly done before. I have always felt that Michelle Obama has so much to tell us about what she has been through and seen -- from all the White House windows -- . I hope she does so one day -- perhaps as soon as this second term is over. The audience of us cheered so wildly for what she was saying. Her honesty caught some of us so off guard. Me included. We kept applauding and standing up for her courageous words. Has there ever been a First Lady who uttered the word "sexual" in the affirmative ??? and let the truth of that word land in our ears? She knew we were all there to send Miss Maya on her way but you could hear and see in her own determined voice and eyes that she knew she was standing amongst those to whom she never ever ever -- has to explain herself to. You could tell that she knew that the only tribute she could "properly" offer for Miss Maya was a flatfooted uncompromising one. It was one of those Morrisonesque Bluest Eye/Sula moments….It was one of those Mary Helen Washington Black-Eyed Susan moments. It was one of those Mari Evans I Am A Black Woman moments. It was one of those Lucille Clifton -Gwendolyn Brooks moments. I bowed my head afterwards…as if I had just heard something utterly sacred lifting all of us into the air.